Brazil is one of those countries in which the christian faith is quit prevailant. Christmas is celebrated in Brazil with sweet treats such as these cameo bonbons. This recipe is the third of a series of international Christmas Recipes: The first was Arabic Mamoul and the second one Swedish Lussettaker. Cameos are easy to make and dont need any baking which is great when you are stressed out with all the other things that need to be done on Christmas. You can even make them last minute on Christmas Day. 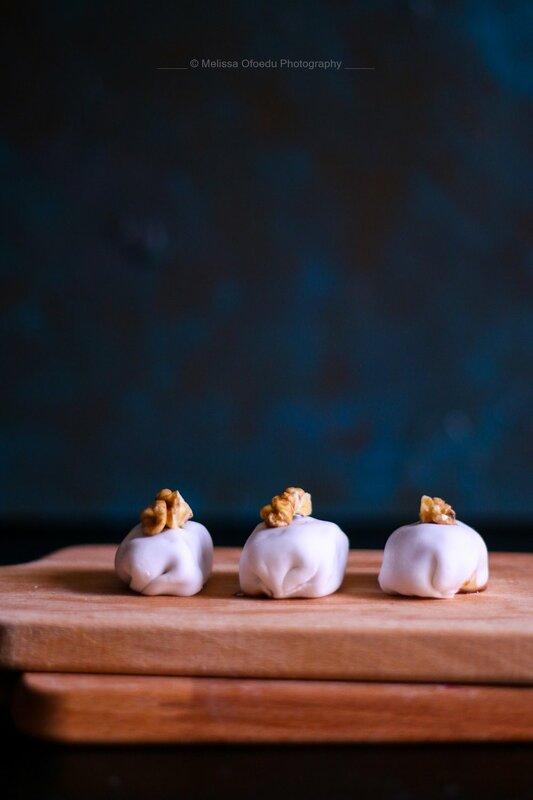 For the Cameo Bonbons you only need 4 ingredients of which some you might even have at home. You´ll also need Fondant, a sugar past that can be bought in most bakery supplies but you can make Fondant yourself which is not that difficult. I decided to buy the Fondant and I used two different types: clear white fondant with which has no particular taste and Spekulatius Fondant which will give the Bonbons an extra taste of Christmas. However if you are interested in a recipe for fondant just let me know and ill post a recipe. For now enjoy those delicious Brazilian Cameo Bonbons that look like a present in itself. [yumprint-recipe id='60'] This Recipe was adapted from the Amazing Flavors of Brazil.